, corresponding to amino acids 541-553 of Human FOXC 1. Our Abpromise guarantee covers the use of ab5079 in the following tested applications. WB Use a concentration of 0.5 - 1 µg/ml. Predicted molecular weight: 57 kDa.Can be blocked with Human FOXC1 peptide (ab23069). IHC-P Use a concentration of 4 - 6 µg/ml. Perform heat mediated antigen retrieval with citrate buffer pH 6 before commencing with IHC staining protocol. Defects in FOXC1 are the cause of Axenfeld-Rieger syndrome type 3 (RIEG3) [MIM:602482]; also known as Axenfeld-Rieger syndrome (ARS) or Axenfeld syndrome or Axenfeld anomaly. It is characterized by posterior corneal embryotoxon, prominent Schwalbe line and iris adhesion to the Schwalbe line. Other features may be hypertelorism (wide spacing of the eyes), hypoplasia of the malar bones, congenital absence of some teeth and mental retardation. When associated with tooth anomalies, the disorder is known as Rieger syndrome. Glaucoma is a progressive blinding condition that occurs in approximately half of patients with Axenfeld-Rieger malformations. 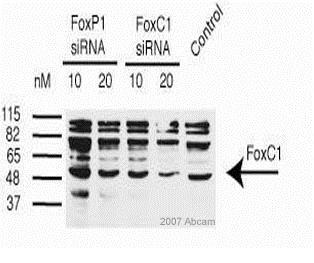 Defects in FOXC1 are a cause of Peters anomaly (PAN) [MIM:604229]. Peters anomaly consists of a central corneal leukoma, absence of the posterior corneal stroma and Descemet membrane, and a variable degree of iris and lenticular attachments to the central aspect of the posterior cornea. ab5079 (3.75µg/ml) staining of paraffin embedded Human Cerebellum. Steamed antigen retrieval with citrate buffer pH 6, AP-staining. Primary incubations were for 1 hour. ab5079 (3.75µg/ml) staining of paraffin embedded Human Spleen. Steamed antigen retrieval with citrate buffer pH 6, AP-staining. Immunohistochemistry (Formalin/PFA-fixed paraffin-embedded sections) - Anti-FOXC1 antibody - ChIP Grade (ab5079)This image is courtesy of Amanda Evans. 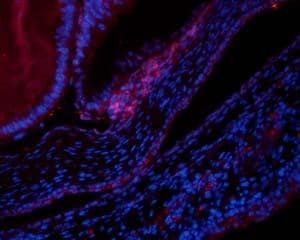 Mouse tissue sections (periocular mesenchyme, cornea) were incubated with ab5079, anti-FOXC1 antibody. Paraformaldehyde was used for fixation, and a heat mediated antigen retrieval step was used. The antibody was incubated for 8 hours at a dilution of 1/200. ab5079 at 3ug/ml staining FOXC1 in human kidney tissue section by Immunohistochemistry (Formalin/PFA fixed paraffin-embedded sections). Tissue underwent antigen retrieval in microwave with Tris/EDTA buffer (pH 9.0). The HRP-staining procedure was used for detection. Immunohistochemical analysis of formalin-fixed, paraffin-embedded Human kidney tissue, staining FOXC1 with ab5079 at 4 µg/ml. Antigen retrieval was performed by heat mediation in a citrate buffer (pH 6).